Alicia's posting of the BBBC challenge goes this way: Is your avatar more or less your current biological age? Do you portray a younger avatar, or older? Why is this? You are, as the overused saying goes, as old as you feel. Except when my knees creak or my muscles tense up from hard physical work--and I do a lot of that on our farm, in our vegetable garden, and in the woodlot--I don't feel old. Iggy looks like me at 30, though ironically, I have better stamina now than I did then. 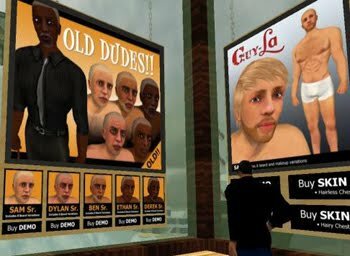 The Iggy avatar, however, could not appear older without becoming a cartoon of an old guy. Aged skins were hard to find, and when I did find them and put on demos, the results were not pleasing. I wanted a bald-headed freak avatar with a gray beard, my actual look IRL, but with a well muscled torso. I'm fit and trim IRL because of my biking, yoga, and my physical work outside in all sorts of weather. I embrace my age. I'm also a typical Middle-Eastern peacock about my appearance, and it saddens me to see how many guys in their late 40s let themselves go. They have big guts, flabby arms, and double chins. They put on Rogaine to rent some hair, though if they are fair skinned that's usually a good choice. Final note, since folks have asked: I added the dreadlocks after a friend in SL insisted I do so for a photo shoot, and I find it hard to say no to friends. Then, in an act of whimsy, I kept the dreads, added a tophat, occasionally a bowler or cowboy hat, and there I am.